James Stewart established himself as a leading actor with this film, the one he is perhaps most identified with – and it was the fifth film he made in 1939. He was again teamed with his co-star Jean Arthur (in the role of a cynical secretary) from the previous year’s Best Picture winner, Capra’s You Can’t Take It With You (1938). Stewart’s character represents the powerful forces of American freedom, democracy and morality over oppression and evil in his emotional portrait of a naive, idealist, patriotic young politician who, after being sent to Washington (a symbol of liberty and democracy) as a junior senator from an un-named state, matures in wisdom, fights political corruption within his state’s political machine, and guards American values as a moral hero. 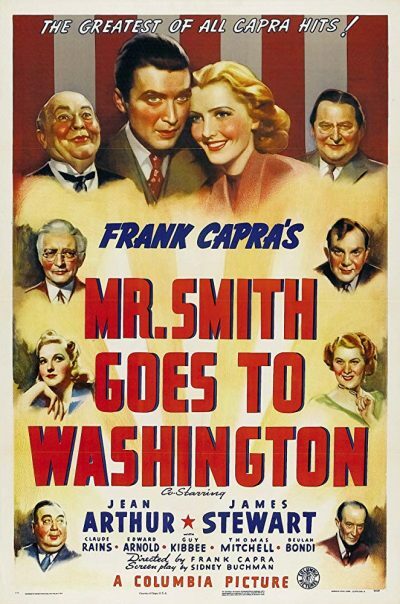 The film is enhanced by a travelogue-montage of tourist sights in the nation’s capital, and Dimitri Tiomkin’s medly of flag-waving Americana songs (“Yankee Doodle,” “My Country ‘Tis of Thee,” “Red River Valley,” and “When Johnny Comes Marching Home”). Production work included reconstructing a perfect replica of the Senate chamber, and the film was faithful to how American democracy works (how a bill becomes a law, political machines, filibustering, etc.). The wonderfully-acted, absorbing and human film was popular at the box-office and critically successful too. However, the film caused some controversy and pressure was brought to bear to hinder its release (two months after the outbreak of WWII in Europe), due to the fact that Capra’s film was propagandistic, depicted political corruption, and appeared to paint an anti-democratic picture of the US government. But the film also called for faith in traditional American values of patriotism and faith in the people. Capra’s film received eleven Academy Award nominations, including Best Picture, Best Director, Best Actor (James Stewart), Best Supporting Actor (Harry Carey and Claude Rains), Best Score (Dimitri Tiomkin), Best Sound Recording (John Livadary), Best Film Editing, Best Interior Direction (Lionel Banks), Best Screenplay (Sidney Buchman), and Best Original Story. Its sole award went to Lewis R. Foster for his original story – originally a novel titled The Gentleman from Montana. In 1940, Stewart was awarded the Best Actor Oscar for The Philadelphia Story (1940), often considered a consolation prize for his loss in this year.